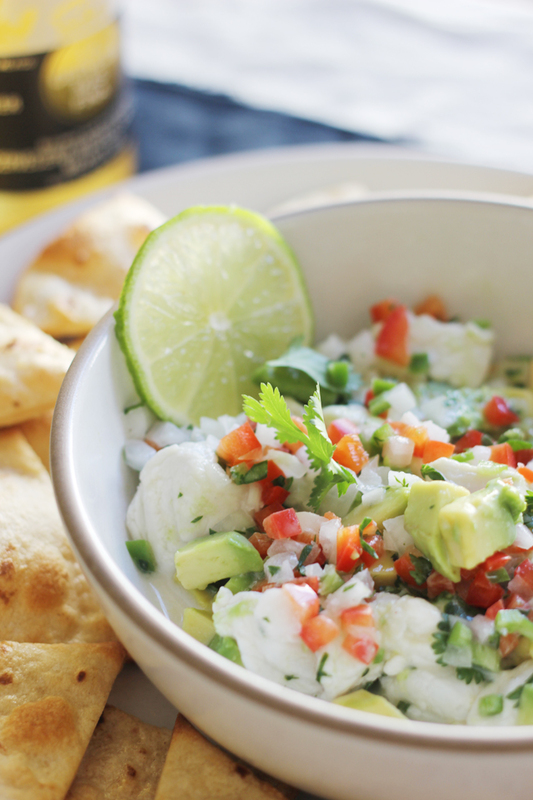 When we stayed at Bardessono, we snacked on the most delicious halibut ceviche poolside. I have never been particularly drawn to ceviche, but I liked this particular one so much that I ordered it again for an early lunch at the pool the next day. The halibut was so mild in flavor, bathed and mildly cooked in a dressing composed of fresh lime juice and sweet coconut milk. The red bell pepper adds a lovely color and texture, the jalepeño adds just enough heat and the avocado adds a delightful creaminess. 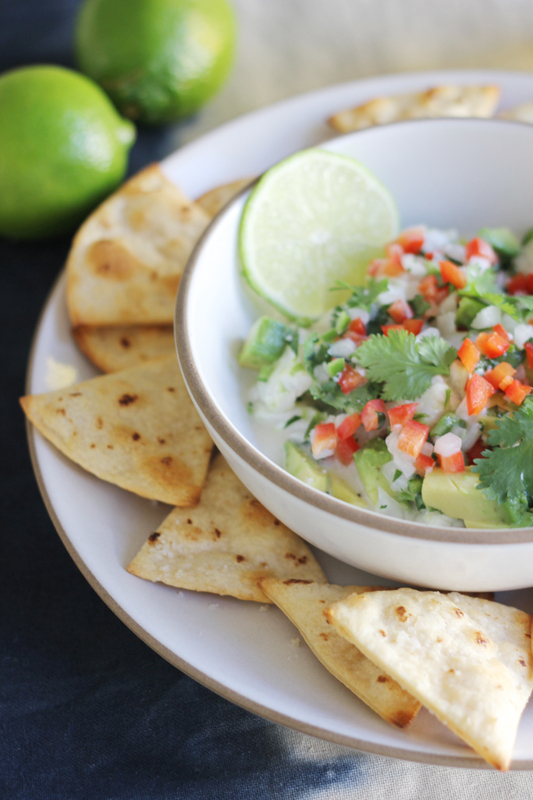 Although the resort served the ceviche with housemade potato chips, I decided to make tortilla chips using corn tortillas, which couldn’t be easier and doesn’t involve heating up a vat of oil. This recipe is so simple it can hardly be called a recipe, but it was so delicious that I had to share it with you. 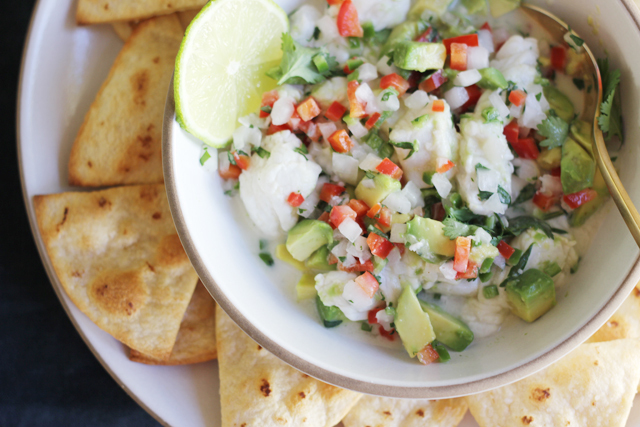 Served with an ice cold cerveza, there is no better summertime snack. Note: For added heat, leave some of the seeds of the jalapeño intact when mixing with the rest of the ingredients. Preheat oven to 400ºF. 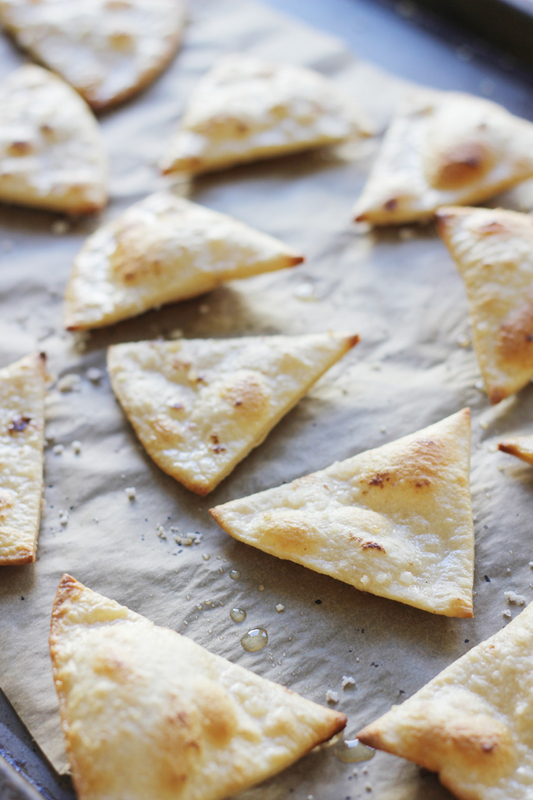 Slice each tortilla into 6 wedges. Place in plastic, sealable bag. Add oil and salt to bag, then seal bag firmly and shake for a few seconds until tortillas are thoroughly coated in oil and salt. 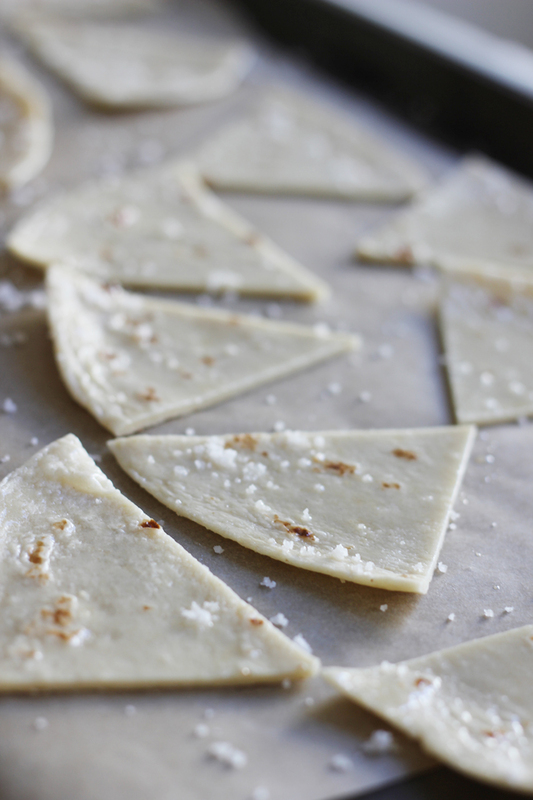 Place tortilla wedges on baking sheet lined with parchment paper, in one layer, and bake for 8 to 12 minutes, or until tortilla chips are golden brown and crisp. 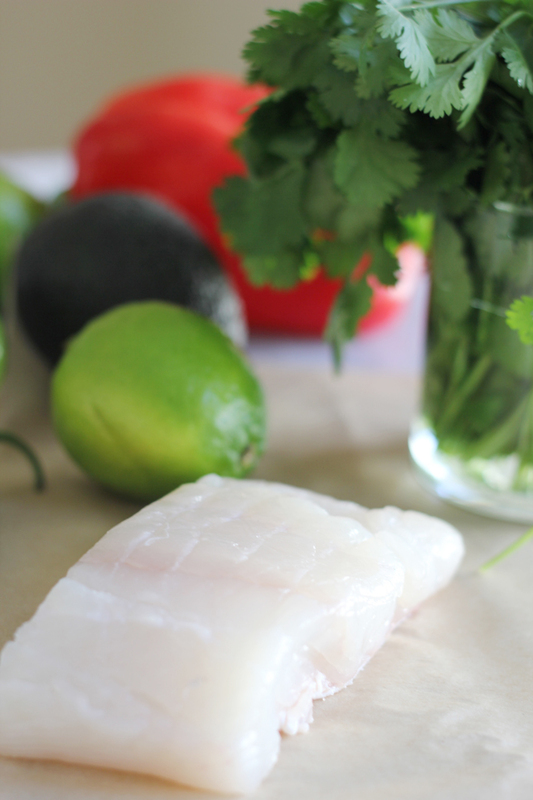 Place halibut into mixing bowl and add coconut milk and lime juice. Add cilantro and both peppers, and stir until evenly mixed. Season with salt and pepper to taste. Let sit to marinate for about 15 minutes or until halibut is opaque. Serve with extra lime slices, if desired. This entry was posted in mains + sides, Recipes, small bites. Bookmark the permalink. 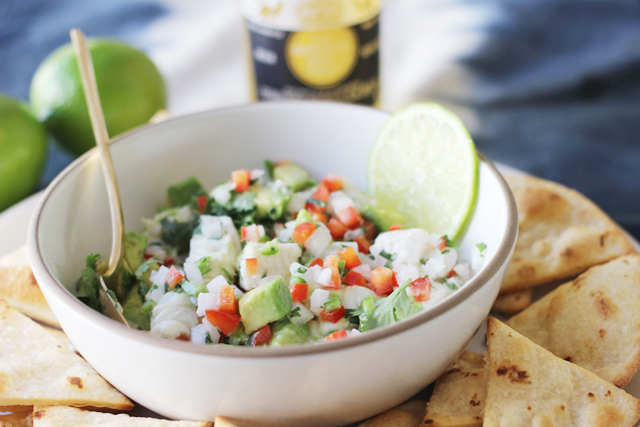 I am not a huge ceviche fan but this sounds wonderful, love the creaminess from the coconut milk and I always love lime in just about anything. Great with the homemade tortilla chips. I could eat this poolside for sure. 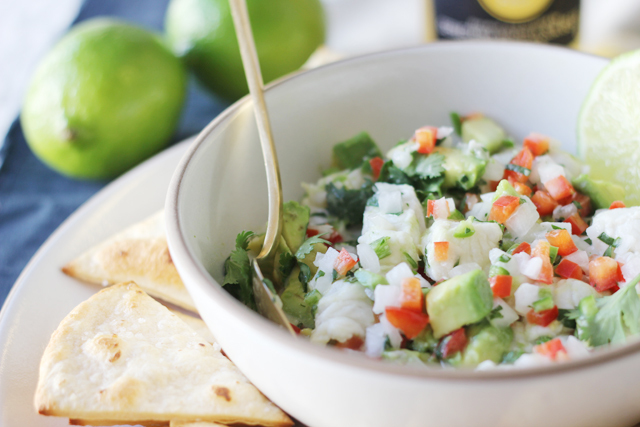 I like ceviche, although where I live now in Western Massachusetts it’s not on the menus… I love idea of adding the coconut milk – a great combination of flavors !! your blog is exquisitely beautiful and your recipes are flawless! I cannot say that my mouth is watering because I do not like fish but your photos are really lovely. 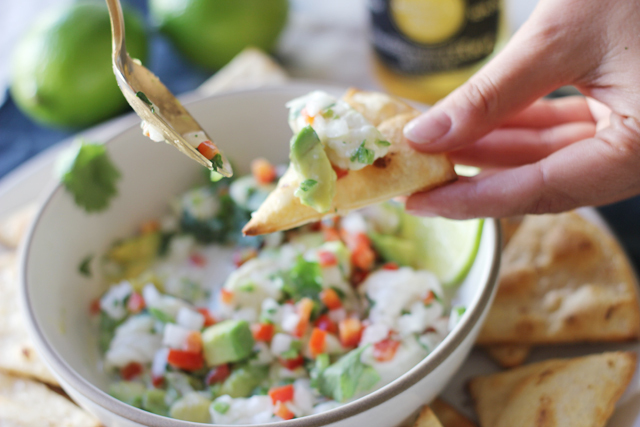 Not only does the ceviche look amazing, but the tortilla chips look super delicious as well! What a great idea! my landlord goes fishing in alaska each year and always give us some of the salmon and halibut that he brings home. i found your recipe on pinterest and knew this would be perfect to try plus i had everything on hand. 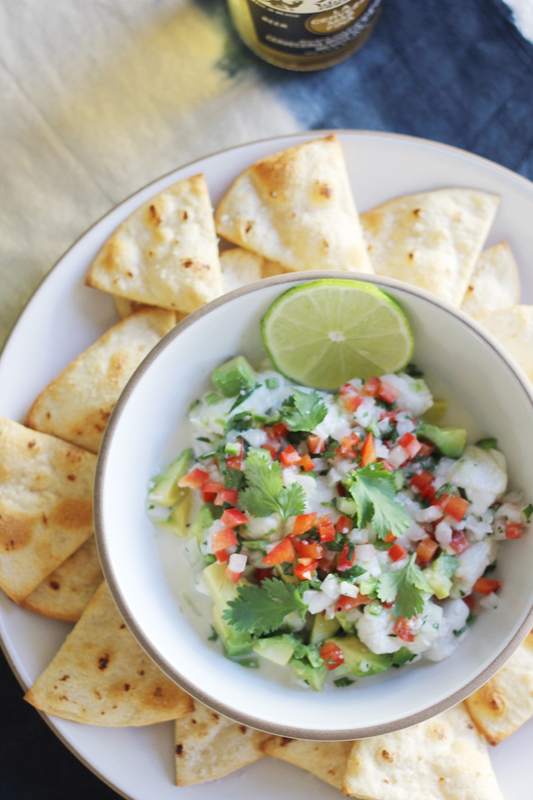 the chips are in the oven as i type and the ceviche is waiting in a bowl on my counter. good call on the coconut milk, too; it really adds that certain something to the final flavor. thank you!! !